In April of 2009, my husband trudged in the door, on a weekday afternoon. He was home much too soon, and walked in while the homeschooling lessons were in full swing. We quickly found out why he was home too soon, he had just been layed off from his job. Sigh, big sigh, and I tried to stifle my worries, cramming them down deep into my being. Fortunately, we didn’t have much debt, just a house payment. We were able to get by on my returning to teaching, albeit as a substitute, for our local school district, and I also babysat a neighbor’s child. My husband was able to find part-time work with 5 different jobs, and job hunting in between those. The St. Louis, Missouri area was just not hiring, not for chemical engineers which is my husband’s field, and as much as we hated to do so, my husband began job searching outside of the area. After 16 months of being underemployed, making do with what we were earning from substitute teaching, babysitting, and 5 part-time jobs, my husband was offered a chemical engineering job in Rolla, Missouri. Almost 2 hours, southwest of St. Louis. I was so grateful that my husband was once again gainfully employed!! To celebrate, we took our children out to dinner, something we had not done much of for 16 months, to Emperer’s Palace, an Asian restaurant that all of us really enjoyed eating at for special occasions. My husband began his new job in September of 2010, and for the rest of that school year, the kids and I stayed in our home in Florissant, Missouri, and my husband stayed in Rolla, only coming to see us on the weekends. As January of 2011 approached, my husband evaluated his work with the new company. He really enjoyed the new job, the new company, and was glad that he had accepted the offer to work there. It was now time to be a family again, albeit all in the same place. In June, we made the move to Rolla, Missouri, saying good-bye to many friends. We had lived in Florissant for almost 20 years, so this was going to be a big change for all of us. Our oldest, in the USMC, serving in Japan, was missing all of this excitement and stress, but we kept him abreast of all the changes as fast as we could. Change can be unsettling. Change can be exciting. Change can be sought after, or it can be placed upon one unexpectedly. I found the forced change for our family as bittersweet. Sweet that husband was gainfully employed once again, that the emergency fund at the bank could be built back up, that I could stop substitute teaching!! Bitter that we would have to start all over, meeting new people, getting used to a new community, after being in our current surroundings for almost 20 years. Saying good-bye to our church, First Christian, would be very hard, as many of our friends were through our church, serving together there, worshiping together there, sharing baby news, going to weddings, funerals;many of the good friends there were like family for us, since our parents, siblings, childrens’ cousins were all in the east, in Ohio and North Carolina. We were also going to have to face the bitter fact of preparing our beloved house for the market, to sell it, and this we knew, was going to be an onerous task. Not so much due to the house’s condition, but due to the housing market. I will continue our adventures in house selling in another blog, very soon! I was glad when I discovered that Classic Film and TV Cafe would be hosting a blogathon about The Archers production company and their films. Why am I such a fan of films that were made years before I was born? Films made in another country too? It comes down to several reasons: great stories told well, actors and actresses at the top of their form, skilled technicians who were also true artists at their tasks. The Life and Death of Colonel Blimp was the second film made by The Archers and it meets my criteria for a wonderful film watching experience. The film tells the story of Colonel Clive Wynne-Candy, from 1902 after the Boer War, 1918 after World War I, and in 1939 at the start of World War II. 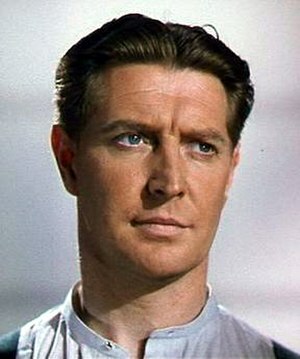 Colonel Wynne- Candy is brilliantly played by actor Roger Livesey. It was his 20th film, but the first time he had the leading role. His effort to show Colonel Wynne- Candy as an old-fashioned soldier, not bending with the times, but not a bombastic fool, was very well done, and it helped allay the fears that Prime Minister Winston Churchill and his Secretary of War James Grigg had about the film. I will reveal more about their threat to the film’s production later. Austrian actor Anton Walbrook was chosen to play German Army Officer Theodor Kretchmar-Schuldorff. His character was a “good” German, who was against the Nazis and all that they wanted to accomplish. This character also rang the alarm bells for Mr. Churchill and Mr. Grigg and more about this later! Deborah Kerr had the female lead in only her 6th film. She was 21 at the time of production and she had to portray 3 different female leads in this one film. She played Edith Hunter, a love interest for both Livesey and Walbrook’s characters, then she played Barbara Wynne, a new love interest for Livesey’s Colonel, and finally Kerr played Angela “Johnny” Cannon, the retired Colonel Wynne-Candy’s driver. The film is primarily a flashback and it gets to the flashback in a delightfully creative way. Deborah Kerr, at the film’s beginning, is Angela “Johnny” Cannon, personal driver for retired Colonel Clive Wynne- Candy. She is dating a brash, young lieutenant, Spud Wilson, who is bored at his base, waiting for a practice military operation to begin at midnight. Retired Colonel Wynne- Candy, working for the Home Guard, has devised the operation and decided it should begin at midnight; the phrase,”War starts at midnight!” is uttered quite a bit in the film’s beginning. Lieutenant Wilson decides to turn the tables on old Colonel Wynne- Candy. He decides to take his men to London to capture the old Colonel at his Gentleman’s Club, thus ignoring the way the practice operation was to go down. Angela realizes what her boyfriend is about to do, and she rushes to London to try and warn the Colonel, as she knows that the purposeful ruining of his plan will upset him greatly. Lieutenant Wilson and his men are filmed in an exciting dash to London, set to jazzy, big band music, chasing after Angela in her vehicle. The younger men succeed in capturing the Colonel at the club. As Lieutenant Wilson and Colonel Wynne- Candy have words by the club’s pool, the angry Colonel grabs Lieutenant Wilson, scolds him for his rude dismissal of the elderly, throws the lieutenant into the pool, jumps in after him, pummels him all the while grousing about young pups, and then Colonel Wynne-Candy ducks under the water, the camera tracking to the far end of the pool, and out of that end of the pool, emerges Colonel Clive Candy, as a young Army Officer, fresh off of winning the Victoria Cross in the Boer War for gallantry. I found that unique pool scene, the way to introduce the flashback, as so creative and inventive the first time I saw the film. 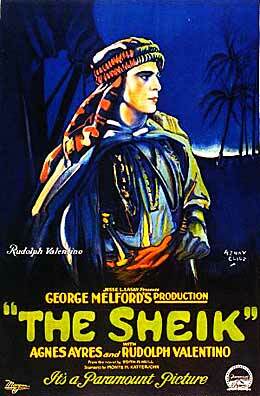 The film moves on to 1902, after the Boer War. Colonel Candy meets Edith Hunter(Kerr), meets Theodor Kretschmar-Schuldorff who he has a duel with. They manage to become great friends with Candy calling the German Officer Theo the remainder of the film. Candy loses Edith to Theo, just as he was realizing that he loves her. Being the honorable British Officer, he doesn’t try to ruin his new friend’s love for Edith. Time marches on and the second part of the movie happens with the end of World War I. Colonel Candy has met a group of nurses who were serving the soldiers during the war’s end, and one of the nurses, a Miss Barbara Wynne(Kerr) catches his eye because she reminds him of Edith. Despite a 20 year gap in their ages, Colonel Candy successfully woos and weds Miss Wynne. No children are born to their union, but their love for one another is evident. As the war is now over, Colonel Wynne-Candy finds out his old friend Theo is in a POW camp near London. Colonel Wynne-Candy goes to the camp to see his old friend, who is surrounded by other POWs when the Colonel finds him. It is an interesting scene, as Theo is decidedly cold and unmoved towards his old friend, rebuffing the outstretched hand that is offered to him. The friendship is renewed soon afterwards, and Theo apologizes for his rudeness. Time marches on once more and now the film is at 1939, and World War II has begun in earnest. Barbara is deceased and the Colonel is alone. Theo is being interviewed by immigation officials as he wants to live in England and not go back to Germany. He sadly explains that his English wife, Edith, is deceased and that their two children are good Nazis who will have nothing to do with their father. Colonel Wynne-Candy arrives at the immigration office in time to save Theo from being sent to an internment camp. The good Colonel has by now retired, yet still wants to serve his country in some capacity. The War Office asks the Colonel to give a speech about the retreat at Dunkirk, and his planned speech isn’t thought well of by the War Office so the BBC contacts the Colonel to tell him his speech won’t be aired. Theo asks to read the speech and in a moving scene, he strongly urges his old friend to realize that the Nazis will stop at nothing to rule the world and to make it over in their desired fashion and that Britain must stop them with all means possible. In a lighter moment, Theo notices that Angela, the driver, resembles Barbara, the Colonel’s late wife, and yes, Colonel Wynne-Candy admits to Theo that he also loved Edith, but wasn’t about to take her from Theo, and that he does like having Angela around as she reminds him of Edith and Barbara. 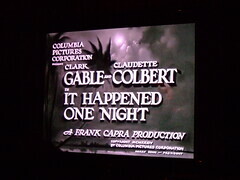 The film ends with the elderly Colonel sitting on a park bench across the street from his home, which has been bombed in the Blitz. At his old home’s site is now an emergency water cistern. He remembers Barbara telling him to never change, and he replied to her not ever would he change, unless their house would become a lake. He says aloud to Barbara’s memory that the house is now a lake, and yet he’s not changed. At that moment Theo and Angela join him as a new guard of soldiers is marching down the street to the strains of a military march and they salute the old Colonel as he salutes them passing by. As I hinted at earlier, Prime Minister Winston Churchill and his Secretary of War, James Grigg, were not happy about this film going into production. 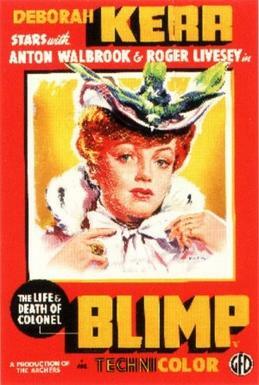 The title, mentioning Colonel Blimp, was the trigger that got their dander up. 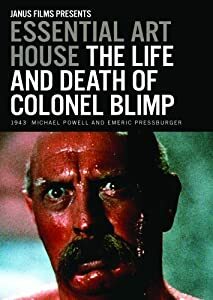 Colonel Blimp was a British politcal cartoon, depicting a bombastic, rotund, bald, retired British Army Officer, often depicted at his club in the sauna room, wearing a large towel, pontificating about social and political issues of the day. The cartoon Colonel Blimp was often contradicting himself in his speeches, and was quite the foolish character. Grigg, in a memo, wrote to Churchill that a movie about Blimp could put the British military in a bad light just as they were in the middle of a war and needed all of the public’s support. The second trigger that worried Churchill and Grigg was the “good” German in the film. Britain was at war with Germany, how could their be a “good” German in this film? The film began production in the winter of 1943 and The Archers were told that no British military advisors would be loaned to them, nor any military equipment. Fortunately, the Canadian military stationed near London, had no problems with loaning their equipment to The Archers! In May of 1943, government officials viewed rushes of the film and their fears evaporated. The film was released to the public that June, and it was a hit. Many film reviewers immediately assumed that the idea for this film did come from the cartoon that incensed Churchill so much, but the idea actually came from David Lean when he was editor for an earlier Powell-Pressburger film, One of our Aircraft is Missing. Lean had to cut a scene in that film depicting an older crew member chastising a younger crew member for not knowing what it’s like to get old. When Lean cut that scene, he told Powell and Pressburger that that scene would make a fine film all on it’s own and that comment from Lean gave them the idea for The Life and Death of Colonel Blimp. Powell and Pressburger were proud of this film and rightly so. They would go on to make two more movies featuring Roger Livesey in prominent roles, I Know Where I’m Going, and A Matter of Life and Death. Anton Walbrook had already appeared in their film The 49th Parallel, and he would famously star as the ballet impresario Lermontov in their film The Red Shoes. Deborah Kerr would also later star as the main nun in another Archer’s masterpiece, The Black Narcissus. Pressburger once said, ” I think that a film should have a good story, a clean story, and it should have if possible, something which is probably the most difficult thing-it should have a little bit of magic…” To me, The Life and Death of Colonel Blimp is an excellent example of what Pressburger was defining. husband had to report to work the following Monday. My memory is a bit faded these 23 years later, but we had the necessities with us, packed in my 1984 Ford Mustang. The movers were bringing the furniture to our new apartment a couple days after our arrival, so we wanted to get there, to our new home, before they did. We were young, 23 years old, and excited to start our new life together, in a completely new place to us, The South! My husband and I both grew up in Defiance, Ohio, in the northwest corner of the state, Toledo the big city to our north, Ft. Wayne, Indiana, the big city to our west. We were surrounded by flat land, corn and soybean farms; Yankees through and through. Driving to our new town, North Augusta, SC was a lovely trip, especially pretty when we drove through the Smoky Mountains of Tennessee. I marveled at those mountains. Northwest Ohio barely had hills! Humidity was reigning supreme as we drove further south, but all of the shops and restaurants and hotels we did business with had air conditioning, I noticed. God bless the man that invented air conditioning and his descendents! I noticed that plants in South Carolina and Georgia were somewhat different than what I had grown up with. When we bought our first house, our neighbors talked about Bermuda grass and Zoysia grass in their yards. Magnolia trees were stunning to me with their large, thick, deep green leaves and their lemon-scented, creamy white blossoms. Gardenia bushes-equally sweet smelling, crepe myrtle bushes, pampas grasses, azaleas, and kudzu were more examples of new plants for me to study. Kudzu, a very stubborn vine that loved to cling and grow on anything it could find to cling to. I had read it was introduced from Japan in the 1920s and it took over the South! One could see it growing willy-nilly in very thick patches along most southern roads and highways. Spanish Moss, ah, we never saw that in Ohio! It reminded me of a dried, grey seaweed, gracefully draped over many a deciduous tree branch, waving in the breezes. Mulch, in our part of the South, was pine needles, or pine straw as the locals called it. No wood chips here! Tall pines with long trunks reaching high to the heavens before a branch appeared were the norm and using their needles for mulch made sense to me, after awhile. Hurricance Hugo hit Charleston, South Carolina that first Autumn we were in the state. Fortunately, we lived on the western side of the state, and merely had a heavy rainstorm for most of the day, and I will never forget those tall pines, bending all the way over with the needled branches touching the ground before being snapped into another bend, needles touching the opposite ground of where they had just touched. Palmetto trees were another tree that I never saw in Ohio. These palm trees were common on South Carolina’s coast. Short, stocky palm trees and a symbol on South Carolina’s state flag. Foods, we noticed, were somewhat different in the South, too. Due to the former agrarian lifestyle that was common all over the South, the older generations could make many meals for their families from one pig! Ham, ham gravy, biscuits with sausage gravy, ham and green beans, fried chicken, greens, chittelings, corn bread, grits, peach pie, peach cobbler, Brunswick Stew, she crab soup, sweet iced tea, sweet potatoes, black-eyed peas, bbq South- Carolina style, slaw dogs, these were some of the foods that I learned about, some to enjoy, some to avoid, and some to make. Our side of South Carolina was the peach growing capital of the U.S. despite Georgia making that claim. It was nice to drive past the peach orchards on our trips north to visit our families. I learned to identify a peach tree quite well and still can do so to this day. South Carolina was one of the original 13 colonies. Fort Sumter, in Charleston Harbor, is where the Civil War began. ( Excuse me, since I used that Yankee word for that war, as I learned from my teaching colleagues, most of them Southerners born and raised, they don’t call that war by that name!) A Revolutionary war battle had been fought in the northern part of the state, at Cowpens. The sea islands off the coast near Charleston also fascinated me, as the natives that lived there, descendents of slaves, spoke their own language called Gullah, a mix of African words and who knows what all else, and they still speak it, which is quite remarkable to me. They haven’t lost that part of their culture. Our town, North Augusta, was right across the Savannah River from a larger city, Augusta, Georgia. Home of the Masters Golf Tournament, always held in March or April, inevitably around Easter. As I taught school in nearby Aiken, South Carolina, many of the schools in our area took Masters week off for Spring Break. My husband and I were fortunate to go to two of the practice rounds two years in a row. The course at Augusta National is so beautiful, breathtakingly beautiful. The azalea bushes all in bloom, with colors of white, red, purple, and pink. Bobby Jones, the course designer, did an outstanding job all those years ago. I was told by a friend that if the azaleas threatened to bloom too soon, the groundskeepers packed them in ice to slow down the process so the azaleas would bloom their best for the television cameras! Southern speech was full of different slang terms and many I had not heard before. “Y’all”, was the only one I already knew. My students liked to get me to utter the slang terms I used while growing up in the North, such as, “You Guys!” I learned from my students that you don’t push a button, you mash it. Grocery carts were buggies. If you were about to start a project, you said you were “fixin'” to start. If you thought you might change your mind, you said, “I might could”. If you wanted a soda to drink, you said you wanted a “Coke”, and then when asked what kind, you would tell them orange, or Sprite, or Root Beer! My students were also trained to say “Yes, Ma’am” and “No Ma’am”, which was a nicety that I really appreciated. Does Southern Hospitality really exist? Yes, it does. I noticed it right away as we settled into our first home. People were quite friendly, holding doors open for people, making people feel at home when they came to visit for the first time. Life seemed to move a bit slower in the South too. Not so many hurrying people as in a big city. The closest we got to feeling that hurry sensation were the few times we ventured to Atlanta. When I think of Spring, or see ads for The Masters on television, my mind and heart always travel back to those five wonderful, sweet years we lived in North Augusta, South Carolina, attending church and shopping in Augusta, Georgia, and teaching school in Aiken, South Carolina. A scene from the movie Black Narcissus, one of the lovely films created by The Archers: British moviemakers Michael Powell and Emeric Pressburger. 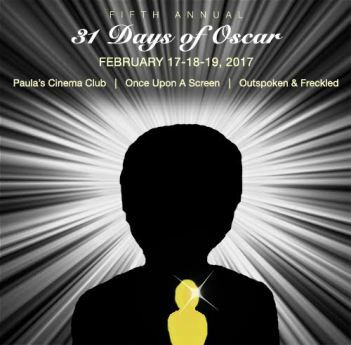 Be sure to read all of the excellent blogs about their films. I will be posting on March 27th about their 1943 film The Life and Death of Colonel Blimp. Two men met one another on the night of February 12, 1976. The meeting wasn’t planned by one of the participants; plotted out by the other. One of the men was actor Sal Mineo, age 37. The other was Lionel Ray Williams, a 21 year old drug addict and robber, often accosting his victims for money to feed his drug habit. Around 11:30 p.m., Sal Mineo was returning to the apartment he was renting in West Hollywood. He was in Los Angeles rehearsing the play P.S. Your Cat is Dead, ironically, portraying a burglar in the play. The play had been in San Francisco, where Mineo’s skill as an actor had received excellent reviews, and the play was a hit. He had decided to act in the show for it’s LA run. The wonderful reviews in San Francisco were a boost to Mineo’s career;it had started out with promise, an immediate rise to successful roles, award nominations, and then for unknown reasons, a trajectory downward. The success of P.S. Your Cat is Dead was proving to be a career boost for Mineo and the events of the evening of February 12, 1976 make his story all the more poignant. The criminal, Williams, was lurking near the apartment building when Mineo drove up and parked his car in the garage. When Mineo headed for the stairs that would lead to his apartment, Williams attacked the actor, stabbing him in the heart. Entertainment lawyer Marvin Mitchelson’s mother lived at the same apartment building as Mineo, and she and another neighbor heard Mineo’s cries for help. They rushed to the garage and to Mineo’s side. Williams had fled at this point. Mrs. Mitchelson and the neighbor called the police and tried to resuscitate Mineo but it was too late. 5 to 6 minutes after the fatal stabbing, actor Sal Mineo was dead. Sal Mineo was not a large man. He stood at 5’8″, of Italian descent. His Mediterranean good looks often found him in movie roles playing ethnic parts. His father, Salvatore, was born in Sicily and immigrated to the United States. He was a coffin maker by trade, and did start his own business, the Universal Casket Company, in his new, adopted country. The elder Mineo met, fell in love with, and married Josephine, herself of Italian descent, her parents hailing from Naples, she having been born in the United States. The marriage produced four children: Michael, Victor, Salvatore Jr., and Sarina. The family lived near the Bronx area of New York City. Salvatore Jr. was born on January 10th, 1939. In researching Sal Mineo’s life for this blogathon, I found an interesting article, written by his older brother Victor. It was written in the late 1950’s, when Sal’s television and film career was on the rise. The article gave a picture of a tough kid brother, who followed his two older brothers all over the Bronx, playing ball in empty lots and back alleys. A tough boy who wasn’t afraid to take on bullies in the schoolyard. A story about two parents who weren’t rich, but worked hard at their business, making sure their kids didn’t want, giving identical gifts to their three sons at Christmas, each child receiving an allowance. One day, Victor explained, Sal Jr. and little sister Sarina were out in front of the family home, trimming bushes, when a talent scout came strolling by. The scout was looking for children to enroll in a dancing and singing academy based in Manhattan. He asked to speak to their mother, who did come out and spoke with this scout. “If you enroll them, we can train them to be on tv”, the scout promised. The two children were signed up and two times a week, with their mom in tow, Sal Jr. and Sarina would ride the subway from The Bronx to Manhattan to take classes at this academy. Sal Jr. was 10 and Sarina was 7. The family could immediately see that Sal Jr. loved the classes and he would practice every night the dance movements without prompting, even trying to teach his older brothers how to dance. The two child performers’ big break happened on a Saturday afternoon television music show. This led to more parts on televison shows, including a 1954 part on NBC Opera Theatre’s production of Strauss’s Salome. Mineo played the Page, lip synching to the voice of Mezzo-Soprano Carol Jones. Theatre work also came young Sal’s way, he appeared in Tennessee William’s play The Rose Tattoo, which starred Maureen Stapleton and Eli Wallach, and Sal also portrayed the young Prince in The King and I, in it’s original run with Gertrude Lawrence and Yul Brynner. This account written by Victor, added that his little brother loved acting, worked very hard at this craft, and also worked very hard when looking for agents, and at understanding the business side of the entertainment industry. The article by big brother Victor didn’t mention young Sal’s run ins with the law and his subsequent arrest for a burglary in 1949 at the age of 10! Another article on Sal Mineo’s life mentioned this, and the judge told the parents to offer their wayward son two choices for reformation: a spell in Juvenile Detention, or classes at the dancing and singing academy. Sal Mineo’s first movie role was in 1955. The movie was Six Bridges to Cross, which starred Tony Curtis. Sal played Tony’s character in his teen years. The next movie, Mineo’s second, would propel him towards stardom. He was cast as John “Plato” Crawford in director Nicholas Ray’s Rebel Without a Cause, which also starred James Dean and Natalie Wood. I was fortunate to find a short documentary about James Dean, called Masters, on You Tube, and the section on Rebel was most interesting. Screenwriter Stewart Stern created a story about troubled teens, utilizing gangs and information about urban gangs. Director Ray had also done research on urban gangs, but wanted the movie to focus on suburban teens and what such a gang from that environment might look like and what they might occupy their time with. The title of the movie was taken from a book by psychiatrist Robert M. Lindner, published in 1944, a book about juvenile delinquents, but no material from his book was used in the movie. Mineo’s character is a 15 year old boy, an only child, often left to his own devices. His father has walked out on the family and has had no contact with his son, and we never see Plato’s mother. He is a very lonely boy. When James Dean’s character, new student Jim Stark, arrives in town, Mineo’s character, Plato, gloms on to the new student for here he has found a friend, a father-figure, and someone to idolize. Later film critics have made much of a possible homosexual attraction that Plato’s character possibly has for Stark, but screenwriter Stern said that no, in writing the two characters, he wanted to show the kind of love and camaderie two young men can have for one another. Not a sexual love, but a strong, brotherly love, as Stern said he himself experienced while serving in World War II. Rebel Without a Cause was released in late October of 1955, a month after the tragic car crash that killed the film’s star James Dean. Mineo was nominated for an Academy Award for Best Supporting Actor for his work in the film. In between film roles, Mineo did a lot of television shows. Omnibus, The Philco-Goodyear Televison Playhouse, Studio One in Hollywood, Screen Director’s Playhouse, Kraft Theatre, Dr. Kildare, The Patty Duke Show, just to name a few. After Rebel, Mineo appeared in the movie Crime in the Streets released in 1956. Portraying a young tough with a switchblade knife, he earned the nickname of The Switchblade Kid. Next up came a part in the film Somebody Up There Likes Me, released in 1956, starring Paul Newman, a biographic film about boxer Rocky Marciano. George Stevens’s film Giant was next for Mineo, portraying a young Mexican man, one of his many ethnic roles. After a few more films in the late 50’s, including Tonka, a film for Disney, portraying a young Sioux, Mineo starred in another biopic flick, portraying drummer Gene Kruppa in The Gene Kruppa Story. 1960 was another big year for Sal Mineo, as he starred in director Otto Preminger’s film Exodus , based on the novel by Leon Uris. Mineo played the part of Dov Landau, a young survivor of Auschwitz, who wants to join the Irgun, a radical Zionist underground network. Dov is also in love with another holocaust survivor, Karen Hanson, played by British actress Jill Haworth. Dov and Karen’s characters are a subplot of the film which focuses on Paul Newman and Eva Marie Saint’s unfolding love story and on Newman’s character, trying to help one Uncle procure Israel’s independence via diplomatic means and saving another Uncle from the inherent dangers in getting that independence through terrorist means. Mineo’s Dov wants to join the radical group that Newman’s Uncle oversees and this Uncle forces Dov to confess that while at Aushcwitz, he was a “somderkommando”, a Jewish prisoner who had to deal with and dispose of the dead remains of the victims of the death camp’s ovens. Dov also has to confess that he was sexually assaulted by the Nazi guards at the camp. Dov is then accepted into the Irgun. He successfully bombs the King David hotel, turns himself in to the police in order to use his explosion skills in rigging an escape from Acre Prison, where by this time in the film, Newman’s radical Uncle is a prisoner. After the successul prison escape, Dov is on guard outside of a kibbutz where many of the refugees from the boat are living, including his love, Karen. One evening, while he is on guard duty, he and Karen reaffirm their love, their goal to marry and their desire to raise their children in a free and independent Israel. Upon leaving Dov to go back to the Kibbutz, Karen is overtaken by a gang of Arab militiamen and is murdered. For this emotional rollercoaster of a role, Sal Mineo was nominated and won a Golden Globe for Best Supporting Actor, and was nominated for an Academy Award for Best Supporting Actor. Inexplicably, even though Mineo had proven to many that he had talent, that he could act, his career in films started on a downward path. He badly wanted a part in Lawrence of Arabia, was not hired, even after auditioning. The same for The Godfather, he was not cast for a part. This ignoring of him by the film community led to more television roles, on such hit shows as Harry O, Hawaii 5-0, Columbo, Mission Impossible, My Three Sons, Dan August, S.W.A.T., Police Story, and Ellery Queen. He did manage to snag a film part in Escape From the Planet of the Apes, playing Dr. Milo. It would be his last film role. Mineo soon turned to theatre work, which he had been quoted saying that it forced an actor to stretch and try new things;while not paying out as much “bread” as film work, it was more creative. In 1971, he produced and starred in the play Fortune and Men’s Eyes, about the brutal life inside a men’s prison. The play received good reviews in LA, but when the play moved to NYC, the critics were harsh in their reviews. In 1972, Mineo directed Gian Carlo Menotti’s opera The Medium, in Detroit, himself portraying The Mute character. 1976 brought a starring part in the play P.S. Your Cat is Dead. The San Francisco production’s success and the postive publicity was garnering Mineo attention once again from the film industry. As the play moved to LA, so to went Mineo, and it was upon returning home late one evening from a rehearsal, that he tragically became the chosen victim of Lionel Ray Williams. After a long investigation, Williams was arrested and convicted by the police in 1979 for the murder of Sal Mineo, and for 10 other robberies in that area of West Hollywood. He was sentenced to 57 years in prison, did receive parole in 1990, but did get put back into prison for other criminal activity. I would be remiss not to mention that Sal Mineo also had a bit of recorded music success, releasing some vocal albums, with some popular songs on them, from 1957-59. “Love Affair”, “Baby Face”, Young as We Are”, just to name a few of his song titles. For those who want to know more about Sal Mineo, there is a relatively new book, Sal Mineo: A Biography, by author Michael Gregg Michaud, in bookstores, libraries, and via online book sources, that has gained good reviews. A funeral mass was held for Sal Mineo on February 17, 1976. The mass was held at Holy Trinity Catholic Church in Mamaronek, New York. He was buried next to his father’s grave at Gate of Heaven Cemetary in Hawthorne, New York. His sister’s husband, Charles Myers, delivered the eulogy: “He was a rare and very special person, a gentle man whose sensitivity and understanding affected everyone he met.” I would like to end my blog on that note, and to say RIP, Sal Mineo, gone too soon, at the age of 37. Be sure to check out Comet Over Hollywood for more blog posts about actors, actresses, directors, and musicians that were Gone Too Soon. Gone Too Soon: A New Blogathon is Coming! Rudolph Valentino, Natalie Wood, Jean Harlow, James Dean, Marilyn Monroe. What do these actors and actresses all have in common? They died too soon! Be sure to read about these and other movie greats who left this mortal coil far too young at Comet Over Hollywood’s Gone Too Soon Blogathon, March 9-10, 2012. 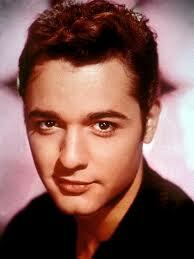 I will be posting a blog about the actor, Sal Mineo.